Porcelain veneers have a varied life span depending on the patient. It is not unreasonable for porcelain veneers to last up to 15-20 years if well maintained and cared for by the patient. Some patients are harder on their teeth than others, some have less favorable bites, are more accident prone, or would be better served to wear night guards while sleeping to protect their investment. In 15 years, the veneers do not simply start popping off, typically, veneers will develop some stain around the gum line that can be polished, or get small chips from wear and tear. Often times small chips can be smoothed or bonded to be repaired. Typically the porcelain veneers that are being replaced today in our office have been in the patients mouth for 10-15 years and are being replaced for brighter veneers that look more natural. Do you need to grind my teeth down to little spikes? No! Porcelain veneers are strongest and most beautiful when they are kept thin. A typical veneer only require .5-.7 mm of thickness to be strong and beautiful, that is approximately the thickness of your finger nail. Often times, dentists will over prepare teeth when they are less familiar with the porcelain veneer treatment. When does this answer change? When patients have teeth that are more crooked to start. Often times patients with crowded and crooked teeth require more reshaping of the teeth to make room for porcelain veneers that make the teeth look straight. We use our experience to help guide you toward more conservative options that could potentially look more natural, such as utilizing services like Invisalign or 6 month smiles to first straighten the teeth before getting porcelain veneers. Do porcelain veneers pop off? No! A properly bonded porcelain veneer will not de-bond from the tooth. With the right protocol, materials and experience, porcelain veneers stay on the tooth. We have hundreds of patients with porcelain veneers over a decade of providing the treatment and have only had a couple porcelain veneers de-bond on back teeth from strong bites. They are an extremely successful treatment option for our patients. What are the most common issues with porcelain veneers? There are not many patients who have issues, but the second most common problems we see with porcelain veneers in our office are very small chips at the biting edges of the teeth and craze lines. Chips can occur when the new teeth are not in harmony with the other teeth in the mouth when a patient is chewing or grinding. The force of the other teeth in the mouth may overcome the fracture strength of the porcelains and a small chip can happen. These chips can usually be polished and if a little larger can be repaired in the office. Craze lines are small cracks that are barely visible through the veneer. This is from excessive amounts of force on the tooth from the bite. 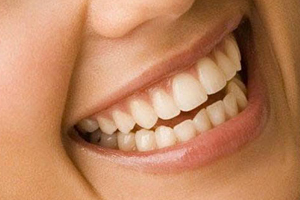 Often times, patients do not notice craze lines and they are pointed out to them by the dentist. In these situations, the veneer can stay on the tooth depending on its severity. Because the veneer is properly bonded to the tooth, even a veneer that is broken in half will not pop off! Natural teeth get craze lines too. They can be seen in the enamel for the same reasons that porcelain gets craze lines. What is the first most common? Trauma. Patients that hit their teeth against something really hard, like railings when playing with kids, car doors, and pavement. Porcelain veneers will unfortunately not make you less clumsy. To help your veneers last as long as possible, it is important to follow some simple guidelines. You can still get cavities, even though you have veneers, so it is important to keep coming to our office for routine visits as recommended. Most of the small issues can be prevented my maintaining regular visits to our office. In this manner, small problems are quickly caught by our dentist and trained team and can be addressed much much easier, than problems that go undiagnosed. This included going to a dentist that does not preform veneer treatments on a regular basis, who may not be as familiar with how to problem solve issues with porcelain veneers. We recommend low abrasive toothpastes. Many toothpastes are loaded with silicates to scrub surface stain from enamel. We may also recommend a night guard for sleeping if you have be diagnosed with sleep bruxism or the bite is able to be idealized by the treatment. Lastly, do not use your teeth as tools. That means, no biting nails, thread or opening beer bottles. Did we need to mention the last one? And yes, you can eat apples!